Religious initiation rituals often serve to demarcate those who cross the threshold from outsider to insider, to express the deepest values of the community, and to offer a spiritual map to those who enter the terrain. By the late Middle Ages, young women entering the nunnery pass through several different ritual experiences in the process of becoming part of a religious community. For example, they are, as infants, baptized as Christians, they are welcomed as novices into a specific community, and they profess their vows. Chief among the rituals, however, is the Ordo Consecratio Virginum or the Order for the Consecration of Virgins. 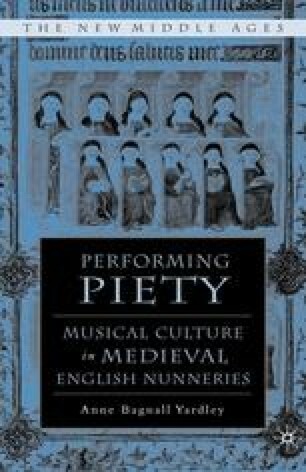 In late medieval England, this elaborate and unique ceremony, performed by the bishop, simultaneously forms the identity of new nuns and reminds older nuns of their vows. The prayers and chants express the imagery of the nun as “bride of Christ” as the bishop and convent enact a complex marriage ceremony.